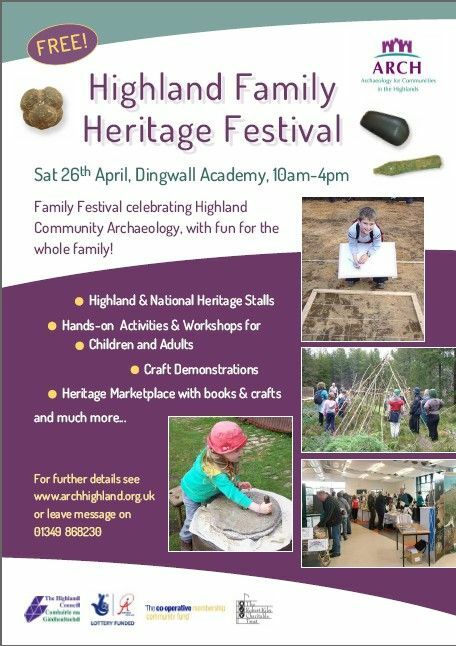 Everyone is invited to take part in the past in Dingwall Academy on Saturday 26 April when Archaeology for Communities in the Highlands (ARCH) is hosting a free family festival celebrating Highland community archaeology. 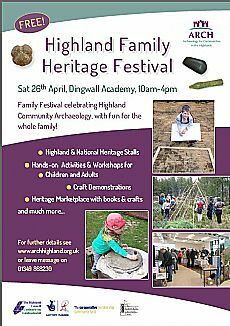 Running from 10.00am to 4.00pm, there will be a packed programme of activities that includes speakers and stalls from across Highland. Confirmed groups and activities below - more to be added as they confirm! * Do you have what it takes to be a Viking? Explore what we can learn about the Picts from their sculpture. 11:30-12:30. All ages. Booking essential. 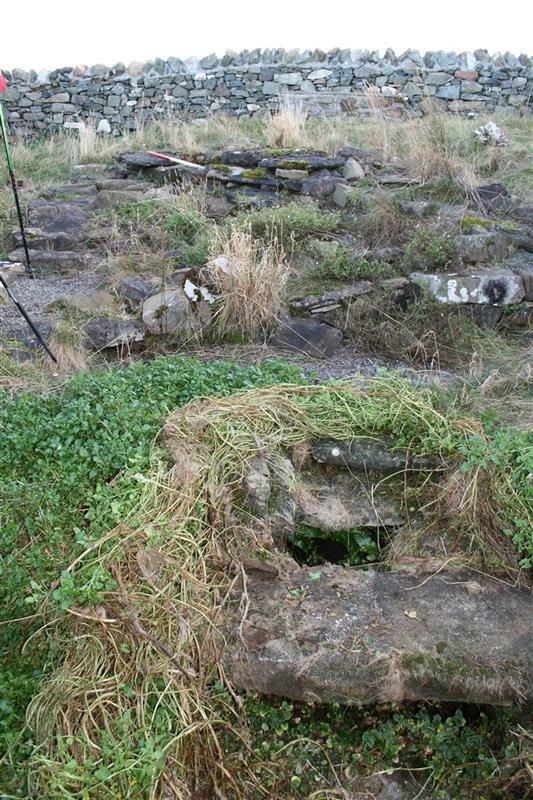 Join Lynne & Lachlan McKeggie looking at Viking burials. 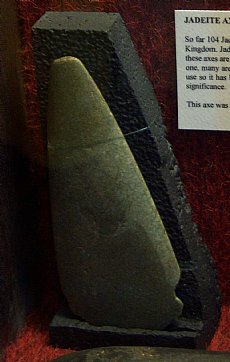 What was important to the Vikings? 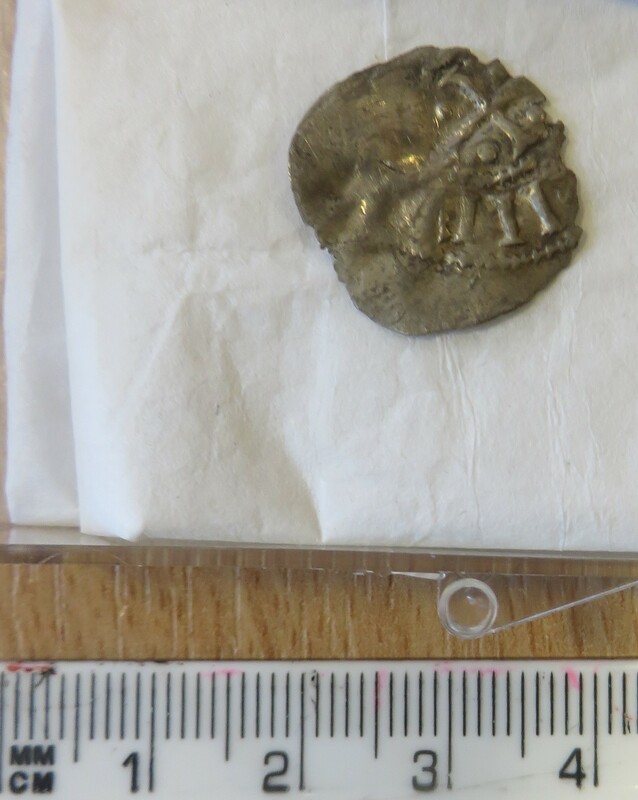 How might we recognise a Viking burial? . 12:30-1:30 or 2:30-3:30. Ages 6-11 (children must be accompanied). Booking needed. How did our ancestors entertain themselves round the fire, after a meal of roast boar or venison? Bob Pegg thinks he may have the answer, with tales and songs of wolves, selkies and hunters, together with the sounds of bull roarers, the deer bone flue and clay pot drum. And - of course - the sotry of the Magic Monster Bear! 1:30-2:30. All ages. Meet Sir Andrew de Moray, and find out about life in medieval times. All Ages. 12:30-1:30 or 2:30-3:30. Sir Andrew de Moray will help you make your own medieval helmet. For children. 11:30-12:30. Booking suggested. Scotland has a rich tradition of maps, many of them easily available on the internet. Come explore. 11:30-12:30. Limited places, so booking needed. Join George Grant of YAC, and help build a bender outside. Throughout the day. Susan Finlay will help you learn how to make willow baskets. Throughout the day. Join Anne Coombs of NOSAS for an introduction to this surveying technique. 1:30 outside. Susan Fraser will show you how to make felt. 10:30-11:30 or 2:30-3:30. Bring a hand towel if possible. Lynne McKeggie will help you make a variety of crafts using ancient textile skills. At various times throughout the day. 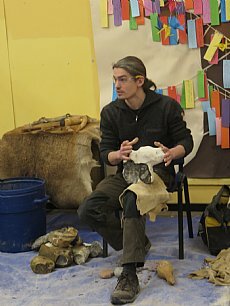 Ian Hammond will show how rope was made, and lead seals created, based on finds from Cromarty. 10:30-11:30 and 1:30-2:30. Historic Scotland's master stonemasons display their craft. Come watch and ask questions. Throughout the day. Stig will provide a general greenwood demonstration with shave horse and pole lathe, and display of wooden spoon carving. Demonstrations by the Highland Guild of Weavers, Spinners and Dyers. Short talks in front of displays. Timetable to be posted on the day. Various organisations are bringing short films and slide shows. Timetable to be finalised on the day.